We've made it to week 11 of The Floss Box summer stitch school. Time flies when you are having fun, and stitching is lots of fun! This week I chose a good, classic stitch: the feather stitch. It's easy to make and very pretty and versatile. Traditionally, it's a line stitch, but pretty much all line stitches can be made into fill-in stitches. This stitch has a side to side pattern as shown the pictures. With your needle grab a bit of fabric to the right and in the middle where the needle was brought up. Make sure the thread is wrapped under the needle. For reference, I call the individual units "loops". After you pull the needle through, simply make a similar loop to the right of the first. Repeat the pattern down to make your line of stitches. At the end of the line just make a small straight stitch at the end. You can of course, make the straight stitch longer or shorter as you like. The first variation is the standard feather stitch. Variations marked 2 are different ways to form the right and left loops. They can be made so the loops follow a straight line down the middle, or formed with very wide, shallow loops. The right and left sides can be assymetrical too for an interesting effect. There are many, many more ways to line up the loops, these shown are but a few of them. This shows two lines of feather stitches with one on top of the other. This layering gives a whole lot of texture to the stitch. You can vary the number of side to side loops. This shows two loops in each direction. You can do many more or make them with varying number of side to side loops. The feather stitch can be easily wrapped, threaded or whipped. Here I have threaded the feather stitches with a different thread through the loops. An example of how you could add beads to the feather stitch. 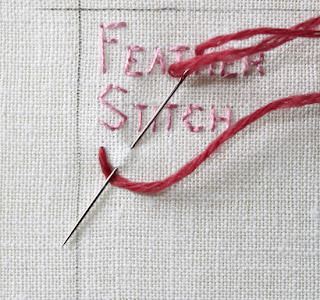 By making rows of stitches, you can make the feather stitch into a filling stitch. In this example the stitches are lined up so they share holes. An interesting wave pattern emerges when the stitches are lined up like this. I hope you enjoyed this week's lesson. Next week will be the final lesson. I hope these have helped a few of you out there to be inspired to pick up your needle and try something new! Another great batch of stitches....thanks sooooo much! !